I was asked recently about how to correctly interpret the Bible. This is a legitimate question which has repercussions on one’s salvation, when one thinks about it. If one does not correctly interpret God’s Word, then one will end up disobeying God on a host of different matters. Disobeying the laws of God is the biblical definition of sin (1 John 3:4), and the wages of sin is death (Rom. 6:23), specifically the spiritual, eternal death of hell (Rev. 21:8). Our Lord does not want any of us to experience that (2 Pet. 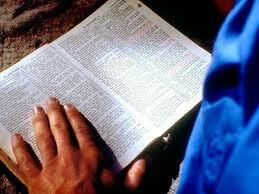 3:9), which is why Christians are commanded to accurately handle God’s Word (2 Tim. 2:15), a command which implies by its very existence that it is possible that one could inaccurately handle God’s Word. Thus, correct interpretation of the Bible is a necessity. One way to inaccurately handle the word of truth – having a post-modernistic, relative view of truth rather than recognizing that truth is absolute – was discussed in the previous article. Yet, even if one recognizes that truth is absolute and looks at the Bible with that mindset, it is still possible to misinterpret Scripture. For example, one could look at parts of the Bible to be absolutely true while failing to realize that the entirety of Scripture is truth (Ps. 119:160). This fallacy of thought has led sincere people to dismiss some parts of the Bible as myth and other parts of the Bible as not applicable to us today. However, the Bible says that every word of God is “tested” (Prov. 30:5). This means not only that every word in Scripture has proven to be true (John 17:17), but that every word also has a reason to be in Scripture…namely, to provide us with the way to eternal life and godliness and the means to be involved in every work that God deems to be good (2 Pet. 1:3; 2 Tim. 3:16-17). Therefore, one is well on their way to correctly interpreting the Bible when they recognize that first that every word from Genesis 1 to Revelation 22 is factually, doctrinally, and historically true, and also that every word from Genesis 1 to Revelation 22 is there to help them in some way grow closer to God and eternal life. Thus, they will accept the biblical account of creation and the biblical record of miracles of God performed by men to be historical fact. They will accept the commands and principles of God found in Scripture to be applicable to them and to all men of all cultures and times. If they conclude that there is a law or principle found in Scripture that does not apply to them personally, it will be only because God’s Word specifically said so (cf. Heb. 8:7-13; 1 Cor. 11:13-16). If they believe that a certain part of Scripture is figurative rather than literal in its language, it will be solely due to evidence found in Scripture rather than their own musings and theories (cf. Rev. 1:1‘s “signified”). Finally, if they read that a certain verse commands them to do a certain thing in order to be saved while other verses command additional things in order to be saved, they will accept the fact that they need to obey all of those passages rather than just one or a few of them (Ps. 119:160; cf. John 3:16; Mark 16:16; 2 Cor. 7:9-10; Rom. 10:9-10; 1 Pet. 3:21). Lord willing, future articles will give specific examples to illustrate how the hermeneutical principles expounded in today’s post are true. I encourage you to tune in, and in the meantime leave civil comments and questions. These will help frame the illustrations I plan on giving to show what is needed for correct biblical interpretation. Thank you for reading, and I hope to hear from you!